I'm kicking off the working week here on the blogeroo with a good ol' fashioned blog hop as Top Dog Dies joins forces with The Twinery! You should have hopped across here from my fellow Top Dog Dies teamie, Amy T. If you haven't then be sure to start out at the Top Dog Dies blog. You may not see it too well in the picture, but I added a watercolour wash in the background of light blue. It looks like subtle sky IRL - you'll have to trust me on that one. The watercolour fun comes from yet more fun I'm having on the current watercolour Online Card Class. I used Distress Inks to create my bold, red balloons and couldn't resist added both sparkles and a coating of Glossy Accents. So shiny! I hope you can find time to check out more Top Dog Dies and The Twinery goodness. Oooh and be sure to enter the draw on the Top Dog Dies blog to win $50 in wafer-thin dies. Next in the hop is my TDD teamie, Giovanna. Happy hopping! okay, now how cute is this?! Hi Aimes! Those glossy red baloons are fab - the natural twine looks perfect with them! HOW ADORABLE, Amy! love those glossy hearts! I can see the touch of blue on the background. Really looks nice. the balloons are so cute and the twine "strings" are a great touch. Super cute and lovely project, Amy!! Love the very glossy heart. Love those glossy balloons, Aims! Great card! I love that song!!! I love the glossy balloons! very cute--I like your shiny heart balloons. Love the red balloons! Especially like the blue behind them. Love those red red balloons! Nice and sweet. The balloons are yummy!!! I love those shiny red balloons, reminds me of a book my daughter had when she was a wee one!! I love how you anchored the balloons, Amy! You make the balloons look amazing! Love the subtle background water-coloring, too! Very cute card! I love the glossy red balloons! Adorable card! Now I'm going to have the "Luftballoon" song in my head. Love the deep red of the balloons. Pretty red balloons! Great CAS card! I love those balloons!! very awesome! Gorgeous CAS design. I love that soft wash background and of course those stunning red balloons - but now I can't get the song out of my head. such a fun use of those hearts, love it! Very cute C&S card! Thanks for sharing! Now that song is in my head, too...cute card! 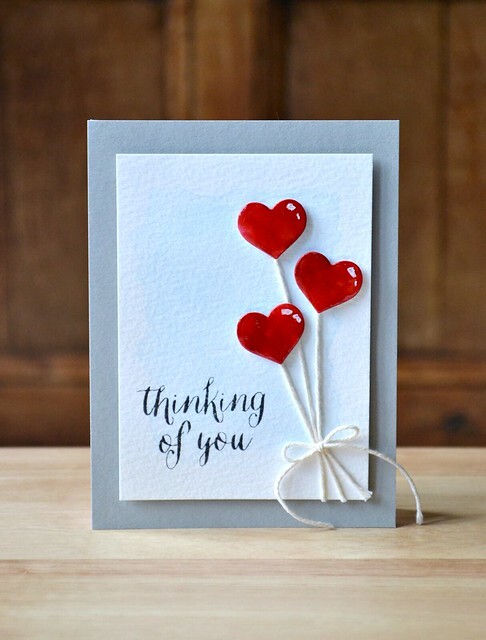 I love your balloon bouquet card! Fun design, and great use of the dies and twine! Those balloons look great with the glossy accents! Cute fun card. This is gorgeous and I love that watercolor background! Amy this so lovely! Love the red color pop so well! Very nice background!